Home Humor Parenting Humor Parenting Tips If You Have A Kid Obsessed With A SmartPhone Or Tablet, READ THIS! If You Have A Kid Obsessed With A SmartPhone Or Tablet, READ THIS! My friends, I have found an awesome learning app for the whole family to enjoy TOGETHER! While laying in my zero gravity chair (LOVE IT!) in the backyard, after a particularly busy Sunday, I looked over at FTD and asked if he knew what star was so bright over my head. He said it had to be a planet because it was so bright, then guessed it to be Jupiter. I was floored. How cool to lay in my backyard and look up at a planet! Then he says, download a star gazing app and see which one it is. He told me to download this free app that all I had to do was point my phone at the star and the app would tell me what planet it was. Sure enough, he was right, it was Jupiter! The app is so cool All I had to do was move my phone over a star and the app would tell me about it. By the time we were all stared-out, we had walked all around the house to see all the night sky had to offer. I can honestly say, I learned more with that app in twenty minutes than I've learned with any other app. I cannot wait to show Ollie one night before bed. I have this wonderful dream of him, FTD and I laying in the backyard pointing a tablet at the sky. Then, picking one constellation or planet to read and learn more about at bedtime. What a freaking awesome way to spend a family night! I can't recommend enough that you download a stargazing app if it sounds even remotely interesting. Kids will no doubt LOVE it. I know I sure do, you know, being a big kid and all. You can use the app during the day, no visible stars needed! 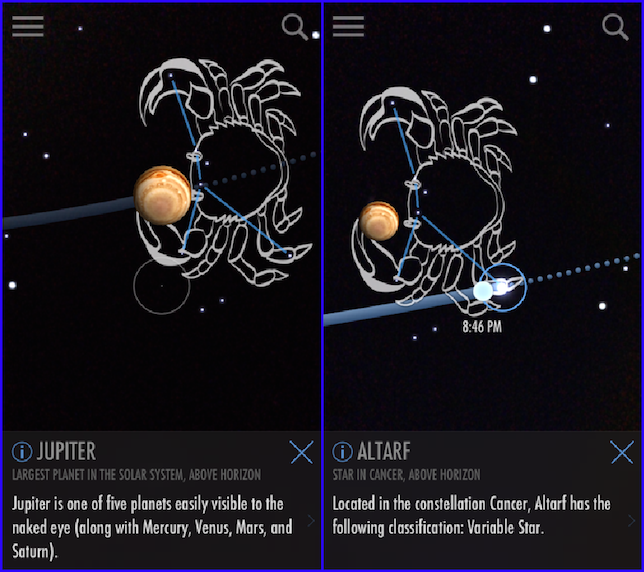 Do you have a stargazing app you love? Have you ever stargazed with your child(ren)?